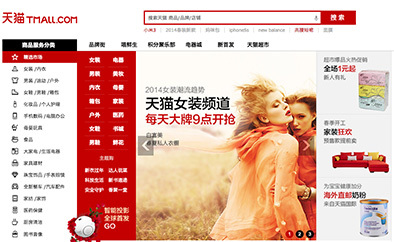 The below diagram outlines the consumer's experience from searching for a product to making the purchase and leaving feedback on the Tmall.com platform. The user has already placed their search and is able to compare search results to hone in on what they are looking for. After the user selects a product from the search results page, they arrive at the product detail page where product information is displayed. Product information should accurately describe the displayed product and may include pictures and marketing materials. The merchant prepares all related materials. After clicking the “Purchase Now” button, the user lands on the confirm order page. Here, the user must input or select the address to where the product is shipped, adjust order details, confirm delivery method, and submit the order. After the user submits the order, they arrive at Alipay’s payment platform to complete the payment process. The user has the option of paying for their order with their Alipay account (China’s most popular online payment tool), or paying with a debit or credit card. After the user confirms payment, they arrive at the payment successful page. This page displays the price that was charged for the products ordered. At any time, users may navigate to the order management page to check the status and track the orders of the products they have purchased. Once the customer receives their order, they may leave public feedback about their experience. Feedback and evaluation may include product quality, service, speed of delivery, etc. and is anonymous. The score and feedback of the merchant directly affect search results, which will influence merchant sales volume. This mechanism serves to reward quality merchants.